Hat tip to Northern Kentucky Views on Facebook for pointing out that today marks the 204th birthday of the famed Civil War general, educator and astronomer. He was born in Morganfield, Kentucky and the town of Fort Mitchell in Northern Kentucky is one of several places named in his honor. Please note that the town has 2 "ls" at the end of its name, but there is only one on the end of his. Nobody seems to know why or when that changedc, but even during the war, Cincinnati newspaperws sometimes spelled the forticiatin called Fort Mitchel with the 2 "ls" so it has been a common change for a long time. Richard - thanks so much for featuring Mitchel! I first became introduced to him while reading Russell Bonds' "Stealing the General" and was fascinated by his scientific/math background. Keep up the great work on the blog! 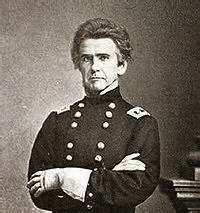 Mitchel may have vp even one of the more well-rounded men in the war, but his early death was too bad.